THE FORUM is Pompei’s main square; besides being the social community's main gathering spot, it also serves as the Law Courts, the Senate’s Offices, the main Food Market, the town’s food deposit, Jupiter’s Temple. 4-day a week basis. When there weren’t any cases being heard, inside the Building there would be held a General Market. 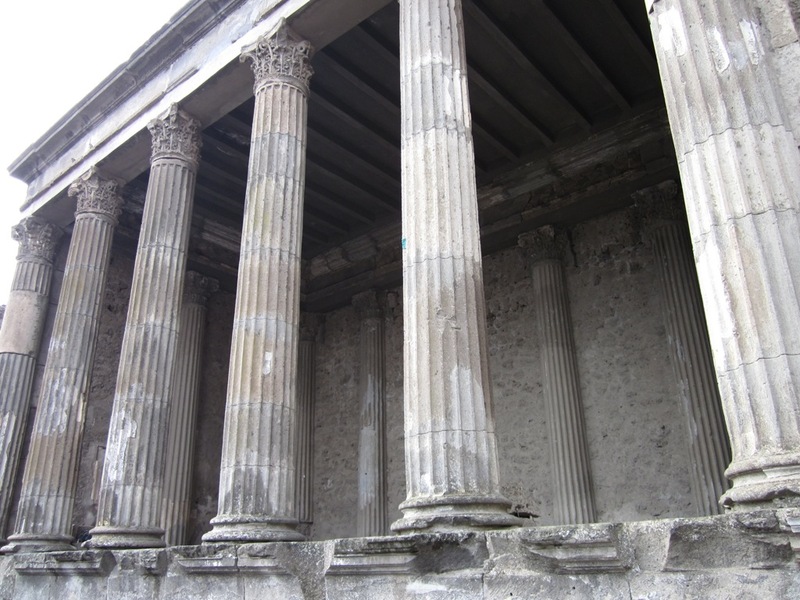 (Above) The raised tribunal is fronted by six Corinthian columns. The Basilica played an important role in both civil and commercial life of Pompeii. It was the center of Pompeii's judiciary system, where law was administered, but also the center of trade. The Forum, a rectangular area of about six hundred and twenty square metres paved in limestone, acted as the main urban economic, political, and religious center of Pompeian life, playing a fundamental role in the everyday lives of the town’s inhabitants. The Forum’s different buildings operated as one of the city’s most important meeting places, a gathering place of great social significance as it also operated as the center of the city’s judicial system, Pompeii’s marketplace, gymnasium and even a public bathing center. Here, bustling crowds of people would gather to meet, gossip, run business, even worship. The main Forum is flanked by a number of adjoined public buildings, the most notable being the Basilica- the most important public building connected, as it contained the law courts and therefore became the focus of the city’s judiciary system while also accommodating the types of business meetings taken place in the Forum. Judging by the tiles discovered near the opening, which contained an Oscan Seal, we know that the Basilica must have been built between 120 and 78 B.C. in the pre-Roman times. Situated at the southwest corner of the forum, the Basilica served as the seat of the law courts as well as a meeting place for business and financial deals, playing an important role in the civil and commercial life of Pompeii. This assumption being based on the Roman architect’s Vitruvius’ The Ten Books of Architecture wherein he addresses the appropriate architectural features and also states, “Basilicas should be constructed on a site adjoining the forum and in the warmest possible quarter, so that in winter business men may gather in them without being troubled by the weather.” Excavators have also found the Basilica consisted of a large hall divided into three sections by tall Corinthian columns and across the hall from the building’s entrance the location of the tribunal. The three areas would have served as the municipal offices for the city's administration, as these would probably have been large enough to accommodate one or more magistrates with their attendants. While the tribunal, a raised, two-storied façade, would have been where all public functions of the judiciary took place and so acted as the focus of the interior as this would have been where the chief magistrates (duumviri) sat and spoke to the people. The duumviri being the town’s highest ranking magistrates whose jobs were to ensure the implementation of the resolutions passed by the town council (ordo decurionum). This is evident by the structure of the colonnade in front of this building wherein one might be able to receive a crowd attending the speech of the magistrate. The second structure, the Tabularium, acted as the city’s official records office wherein laws and other political possessions were kept. This is made evident by the protruding posts that serve as large cabinets wherein these might have been filed. The third structure would have served as the meeting place of the local senate (Ordo Decurionum) which was made up of 100 members, elected every five years according to their status in terms of wealth and acknowledged honours. In the southeast corner of the Forum was the Comitium, which also served administrative purposes, particularly as a polling station wherein the voters would write down the name of their chosen candidate on a waxed tablet, which would be placed in a tablet box. This is made apparent by the design of the area alone, as it was spacious area that had many entrances, which would have served as the voters’ access to their precincts. The structure and layout of these particular buildings of the Forum serve as evidence and suggests the Roman colonization of Pompeii. Therefore these different buildings adjoined to the Forum dedicated to the public administration and political matters of Pompeii, helps to reveal the political system that Pompeii would have followed before the eruption as well as how the Forum would have been used for many different purposes, ranging from business to political and economic matters. The citizens of Pompeii would write graffiti on walls of buildings in well-trafficked areas as well as tombs. This is a rich source of evidence of life in the town. To help give insight on life in Pompeii after becoming a part of the Roman state, evidence such as surviving graffiti scrawled on the buildings by individuals and associations reveals exactly this. They expose the social, political and moral qualifications of the different candidates the citizens of Pompeii would have had to choose from for elections- electoral campaign propaganda. These pieces of evidence give us the impression that even in the ancient days, people engaged in opposing political ideas and opinions as well as promoting their own. The innumerable phrases also suggest that people struggled for political power in those ancient times, as often wealth and therefore a higher social status was associated with this. The main purpose of this graffiti was to create connections with others, political groups in ancient Pompeii sought the same connection- this is evident on the walls of wealthy citizens or walls in well-trafficked areas such as the Forum buildings. Often, the citizens would name the politician’s supporter. Almost always they would include the candidate and the office. As shown in the examples below, they often named the qualities that they believed qualified the candidate for office. Election notices also give us information about how often elections took place in Pompeii. Once campaigns were over, this graffiti would have been whitewashed over, according to evidence discovered by archaeologists. This whitewashing had left layers and layers of graffiti and so we are able to know the names of the candidates for office over the last ten years of Pompeii’s life.